Deana Tice has over 50 years of experience having been an equestrian her whole life, competing in her first show when she was 18 months old. Deana began teaching and helping other young riders when she was twelve years old. She rode hunters and jumpers in top level American Horse Show Association shows including the Washington International Horse Show. Deana was a member of the United States Pony Club, competing in three day eventing and moving through the levels of training. Deana Tice attended the University of Maryland where she earned her 4 year degree and also completed many Education classes. While a student she was a member of the Intercollegiate Equestrian Team competing throughout the East Coast and making it to the Nationals in her first year. Deana has also worked with Quarter Horses. After marrying her husband Joe (a quarter horse person) in 1986, she began riding and training Quarter Horses in Western Pleasure and many other classes on the Quarter Horse Circuit. She continued to help others taking her students to the high level of the All American Quarter Horse Congress. After graduation, she furthered her career, developed her Management skills and was employed with the Southern States Cooperative in Upper Marlboro, MD for eleven years, overseeing 25 employees that she trained and supervised. Through her experience with Southern States, she gained the expertise and knowledge to teach and assist fellow horseman proper equine nutrition and health. 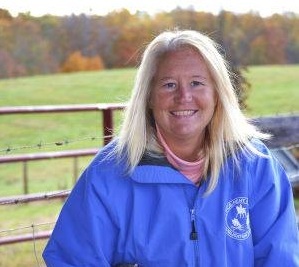 In addition to working for Southern States, Deana started a part time business at Enticement Stables, training, teaching and managing, and to this date, after her retirement from her full time position (10 years ago) she now runs and manages Enticement Stables with the assistance of her Trainers, Instructors, Grooms and Farm Operators with 70 horses at the farm. She is also a member of the MHSA regional Board of directors. Deana and Joe have three sons who enjoy growing up on the farm but they prefer raising livestock to riding horses. So when Deana is not at a horse show she is at livestock shows with Josh, and the twins Cody & Justin.